Topics in font choice and formatting. "What's the best font size for my book?" is a question that comes up regularly on the Lulu forums. Someone will answer, "12-pt," and the question seems answered. This page is meant as a starting place for thinking about book design in greater detail. Font size is not an especially well-characterized number. Sure, most of your computer's fonts have sizes that you can choose. However, the size of the print for a given point size is remarkably variable. We'll start with size and go on to other font attributes in short order. Fonts have recognizability (or legibility) which is an attribute of the design of individual characters. This translates loosely into familiar shapes that are combined in simple and familiar fashion to make individual letters. Readability of fonts depends on how letters work together in words and in lines of text. Readability can be approached as a very esoteric topic or it can be approached by testing samples of text. The latter is more practical for text produced by desktop computers since so many of the variables involved are hidden and cannot be adjusted. It is important to note that printed text differs considerably from computer display text. This is because the resolution of screen text is low compared to the size of the letters. Displaying proportional fonts on a 72 dpi screen is a challenge. A letter with fine diagonal features and curves will appear different depending on the array of dots on the screen that it aligns with in any particular position. Display software differs in the attention to such details as spacing and kerning. Many authorities suggest sans serif fonts for web pages, due to their enhanced readability on computer displays. 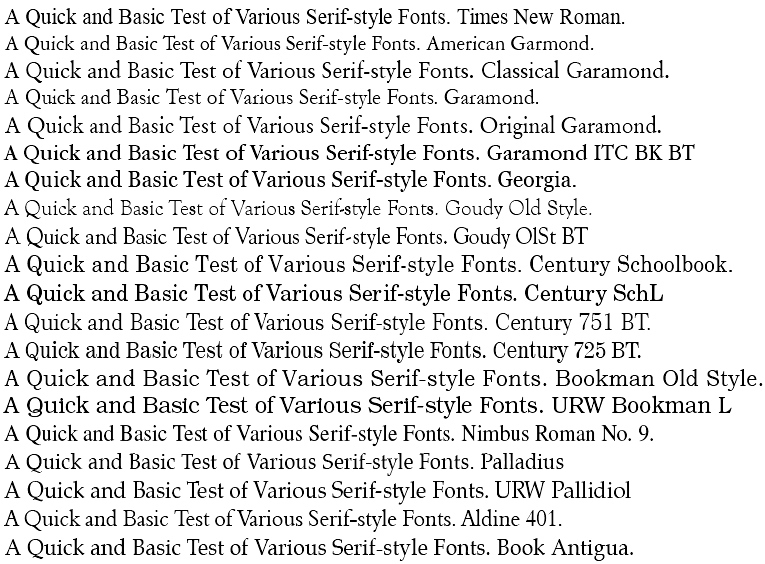 The majority of books are set in a serif font. This is due to a long-standing feeling among typographers that text in a serif font is more readable. Technical books, which are sometimes set in a sans serif font, are the major exception. This may have to do with custom and with the characteristics of recognizable groups of serif letters that assists in reading. Readability will also depend on things like line length, font size, kerning, leading and line justification. There are several messages in the above figure. Importantly, fonts of a given point size will vary considerably in the size of letters and the length of a specific line of text. Note that this is even true of fonts from same family. For instance, near the top, 5 different Garamond fonts are depicted, each of quite a different actual printed size. A closely-related point is that for the letter sizes to vary so much it must also be true that the white space between lines will also vary. Note in this Georgia example the large white space between A and V and between A and W. Compare that to the tight spacing throughout for Garamond ITC. Optimal kerning may not be simply the tightest spacing. As we have shown in our samples, fonts of a specific point size may have both different letter sizes and different amounts of space between lines. Leading is additional spacing that is added to each line to "open up" the text a little. This additional spacing can make it easier for the reader's eyes to scan back from the end of one line of text to the beginning of the next line of text. This may be as important as other issues of font choice in defining the readability of the text. Leading can be explicitly set in most word processors, although it may be called something else. Importantly, both kerning and leading are essential elements in the readability of blocks of printed text and yet are generally ignored by many self-published authors. This brings us back to choosing fonts. Looking at small samples of text like in our first example is good for a first screening of fonts. You can include fonts that are legible and pleasing to look at for closer examination. Check the kerning of problematic pairs and make sure that you do this with printed text since the kerning will not be displayed accurately on a word processor's screen display. However, for the final testing of fonts, nothing replaces the time-consuming process of making test printings of pages in as close to a real-world fashion as possible. Print full pages of text in the format of your book and at the page size of your book. Cut those pages in their final book size and place them into a book that is about the right size to see how they look and "feel" in a book. Scan your eyes back and forth and see how readable the text is. Test how easy it is to rapidly scan from the end of one line to the beginning of the next line. If you carry out this kind of text, varying the font, the font size, the leading and the book formatting you will start to realize that fonts which look fine in a small sample may be tiring or unpleasant to read in a book. In the end, the choice is yours and may actually affect whether your book gets read all the way through. So far our discussion has been about the body font for books. Display fonts are another issue entirely. These are used for headlines, headers, footers, chapter titles, paragraph or section titles. Most display fonts should be chosen for readability also but you are only looking at one or a few words so you do not care so much about scanning a block of text. Instead, you're looking for pleasing accents and making the font stand out from the rest of the text. It is common to have sans serif fonts for display text in books where a serif font is used for the body text. Again expermentation and looking at professionally published books for inspiration are useful ways to choose.